We know that athletes take running, hurdling, relays, and other track events seriously, which is why they need a high-quality track for their performance. 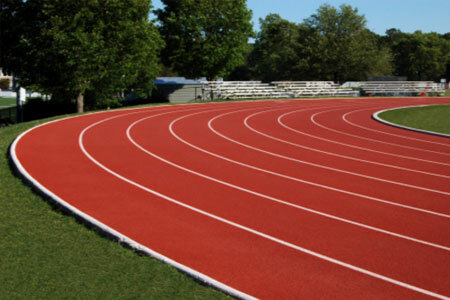 Our athletic track paving service can give them just that – whether it’s a replacement or a new installation, our experts can design and lay a reliable track in any shape or size. Athletic tracks with cracks, divots, or low spots can be dangerous for athletes. They can not only hinder performance, but they can also lead to knee, ankle, leg, and other body injuries. At Mr. Pavement, our tracks are not only level, but they’re built to last so you won’t have to worry about damage as the years go by. When it comes to outdoor sporting areas, athletic tracks can take up a lot of room. That’s why it’s important to have a track that’s not only durable and reliable, but also beautiful. We can install tracks in a variety of colors and create detailed lines for lanes, starting points, ending points, and even numbers. Whether you’re in need of a new athletic track paving at a high school, park, college, stadium, or another location, our experienced team of experts can help. We can create a design for any area – indoors or outdoors – that will stand up to the wear and tear of consistent use. 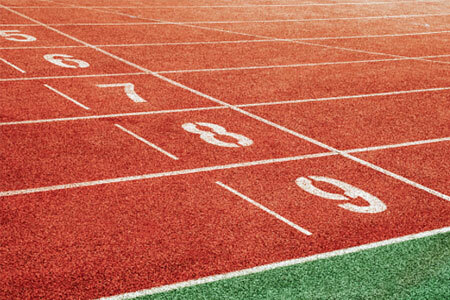 For the best in athletic tracks, give Mr. Pavement a call today. We’ll set up your paving appointment and get started as soon as possible.